SMOKINGUN STAKE: Garanhão homozigoto e importado. HIGH BROW CAT: Ganhador de U$126,252. Certificado de Habilidade NCHA. Campeão Augusta Classic Open , Campeão Chisholm Trail Classic Open , Finalista NCHA Super Stakes Open, 3º lugar no Abilene Spectacular Classic Open , 4º lugar no Steamboat Springs Classic Open . 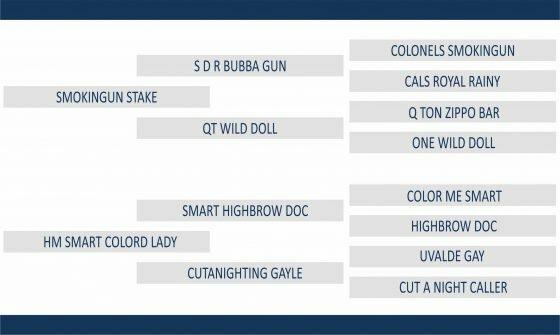 Pai de Ganhadores de mais de U$ 37 Milhões, dentre eles , METALLIC CAT ($590,051), HIGH BROW CD($536,379) ,SMOOTH AS A CAT ($ 501,873; NCHA Horse of the Year ) , BOON SAN KITTY ($ 565,504 e 2004 Horse Of the Year), PAPPION CAT( $379,815), CATS SUMMERTIME ($357,937),HIGHBROW SUPERCAT($324,710), CAT ICHI ($303,651). HIGH BROW HICKORY: U$ 229.771,00. Res. 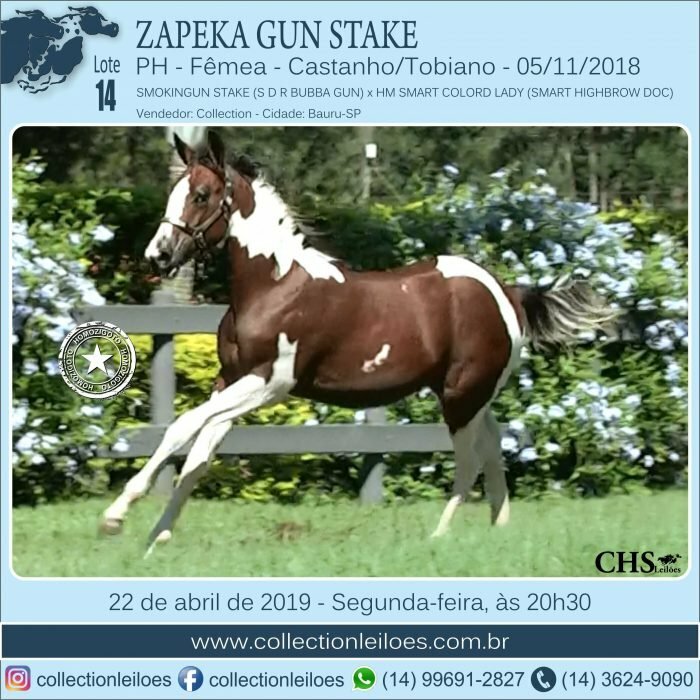 CampeÃo NCHA Futurity Ab.. Seus filhos já ganharam mais de U$ 3.900.000,00. Pai de HIGH BROW CAT, cavalo numero 1 das estatisticas dos últimos 5 anos , tendo seus filhos ganhos de mais de U$ 21 milhoes. Entre os lideres das estatísticas como avo materno, sendo avo de: MH MILLIONDOLLARBILL, U$ 116.475,00, Res Campeão Milionheir Derby NP; HIGH CLASSED MODEL, U$ 76.371,00. SMART LITTLE KITTY: Dam of High Brow Cat. Top Ten World Show Offspring Known HERDA Carrier ROM Performance Offspring NCHA Money-earners Equi-Stat Cutting Offspring LTE: $320,465 Number of NCHA Offspr: 8 Avg Offspr CUT Earnings: $40,058. COLOR ME SMART: Earned NCHA $ 9,716,57 Won 1997 Open Championship at APHA world show. ROM cutting, 35 Cutting points SIRE OF: MULTIPLE APHA AND NCHA CHAMPIONS. SIRE OF THE LAST 3 CUTTING CHALLENGE WINNERS AT THE APHA WORLD SHOW. Offspring earnings of over $3 Million. Average NCHA get earnings of $23,656.